The Powell River Town Centre Hotel offers service, comfort, and hospitality in the heart of Powell River. 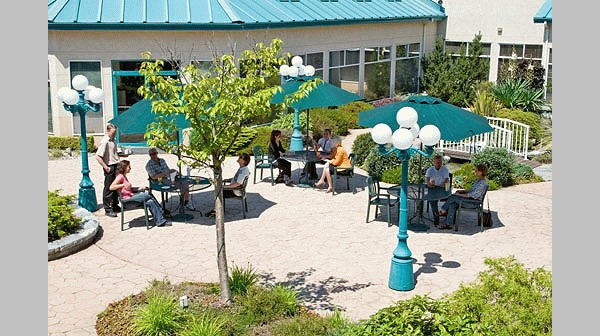 With 71 well-appointed guest rooms, the hotel boasts a beautiful garden courtyard, restaurant, pub, and full banquet/conference facilities for up to 250 people. There is also an exercise room, lots of free parking, and excellent retail facilities adjacent to the hotel property. Just minutes away from the airport and Westview ferry dock, the hotel offers complimentary shuttle service to both. Boat rentals, golf, and excursions can be booked on request. Our Guest rooms include coffee maker, hair dryer, iron and ironing board, cable TV, clock radios, movies and Nintendo games (on request). Guests will find comfort in our standard guestrooms, which include one double or queen bed, two double or queen beds, or one double or queen bed with a sofa that can be converted to a double bed. For the corporate traveler, or those who need the extra space, our Deluxe Suites meet these needs. With the option of a king sized bed and sofa that converts to a double bed or a separate sleeping room with a king sized bed, executive desk and chair, two telephones, refrigerator and complimentary newspaper along with our standard amenities, we meet your needs and will try to honour special requests. Planning a special night? Ask about a romance package. Weddings, honeymoons, anniversaries, birthdays or some other special night, our Bridal Suite will make it a night to remember. Featuring a two person Jacuzzi, King sized bed and all the amenities you need for a night or week to remember! Please visit Powell River Town Centre Hotel Website.